summer salads | What about this? 1. Bring the water and quinoa to a boil in a medium saucepan. Cover, reduce to a simmer and cook for 10 minutes. Turn the heat off and leave the covered saucepan on the burner for another 4 minutes. Fluff with a fork and allow the quinoa to cool. 2. Whisk the oil, lime juice, apple cider vinegar, cumin and jalapeño (if using) in a small bowl. 3. 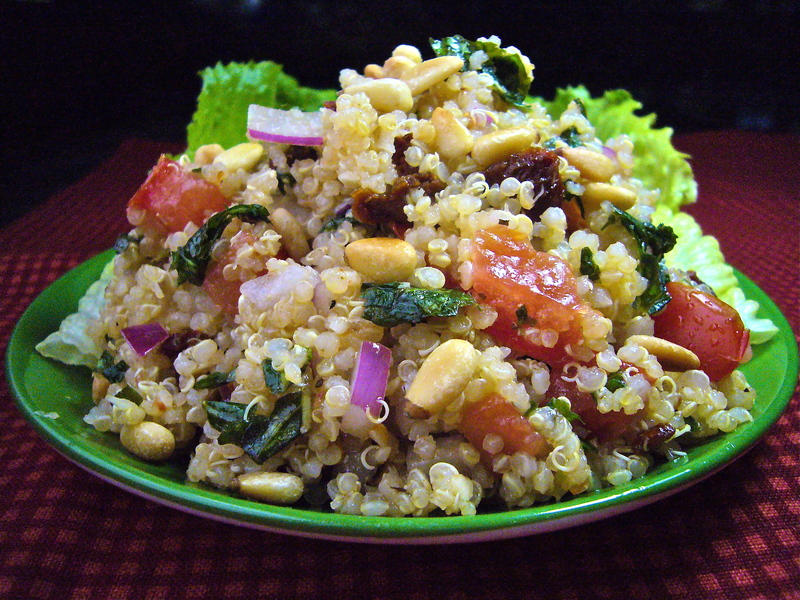 Place the cooled quinoa in a large bowl. Stir the dressing into the quinoa. 4. Toss in the corn, red pepper, black beans, cilantro and salt. 5. Serve immediately or cover and refrigerate in a sealed container for up to 3 days. 1. Quinoa naturally has a bitter coating of saponins. As a matter of habit, I always rinse quinoa in a strainer under cold running water prior to cooking to remove any residual saponin. Some brands of quinoa state that they are pre-washed. 2. I added some fresh ground black pepper. 3. I also added a pinch of sugar to counterbalance some of the combined acidity of the vinegar and lime juice. 4. I prefer serving this salad chilled. It seems more refreshing that way. Mounds of colorful roasted artichoke salad, drizzled with basil vinaigrette, sat on a bed of fresh mixed greens. With roasted red peppers and artichokes hearts, capers, red onion, and parsley leaves, this salad made a perfect side dish for my mom’s Italian-themed birthday celebration. Don’t limit this spectacular salad to Italian dinners, though. You’ll want to serve this versatile dish at al fresco dinner parties, family barbecues, holiday brunches, and more! 2. Place the artichoke hearts in a bowl with 1/4 cup olive oil, 1 teaspoon salt and 1/2 teaspoon pepper and toss until the artichoke hearts are coated. Dump the artichoke hearts onto a sheet pan and spread out into 1 layer; roast in the oven for 20 minutes. 3. Meanwhile, make the vinaigrette. Place the minced shallot, lemon juice, mustard, 1 tablespoon vinegar, 1 teaspoon salt, and 1/2 teaspoon pepper in the bowl of a food processor fitted with the steel blade. Process for 5 seconds. Add the basil leaves and process into a green puree. With the processor running, slowly pour 1/2 cup olive oil into the bowl through the feed tube until the ingredients are finely pureed. Set aside. 4. Place the roasted artichoke hearts in a bowl and toss with enough vinaigrette to moisten. Add the capers, red peppers, red onion, parsley, 4 tablespoons vinegar and red pepper flakes, if using, and toss gently. Sprinkle generously with salt and pepper and let stand for 30 minutes for the flavors to blend. Serve at room temperature. 1. I couldn’t find frozen artichoke hearts, so I substituted canned. I let the artichokes drain in a colander. Before using, I gently squeezed any excess liquid from them. 2. I doubled the recipe, but probably should not have doubled the salt. I normally eat a low-sodium diet, so this recipe seemed a bit salty to me, especially with the addition of the capers, which I rinsed and drained first. I used one 4-ounce jar of capers, which amounted to 7 tablespoons of capers. The doubled amount would have been 12 tablespoons worth of capers. 3. If you double this recipe, make sure you roast it in a single layer in two separate baking sheets. 4. To get a good roast on the artichokes, I needed to roast them 30 minutes longer than specified. 5. In step 4, I cut the amount of vinegar by half and did not add any additional salt. 6. Although the photo doesn’t show it, one of my favorite ways to serve this salad is on a rectangular serving platter. 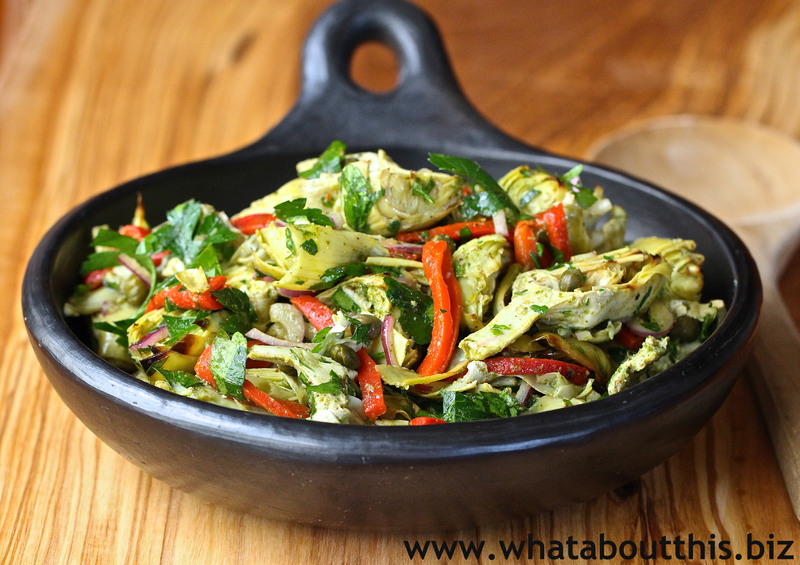 Place a mound of greens lengthwise on the platter and then mound the artichoke salad on top of the greens. Additional basil vinaigrette may be drizzled on top. 7. I made this salad the day before the party. 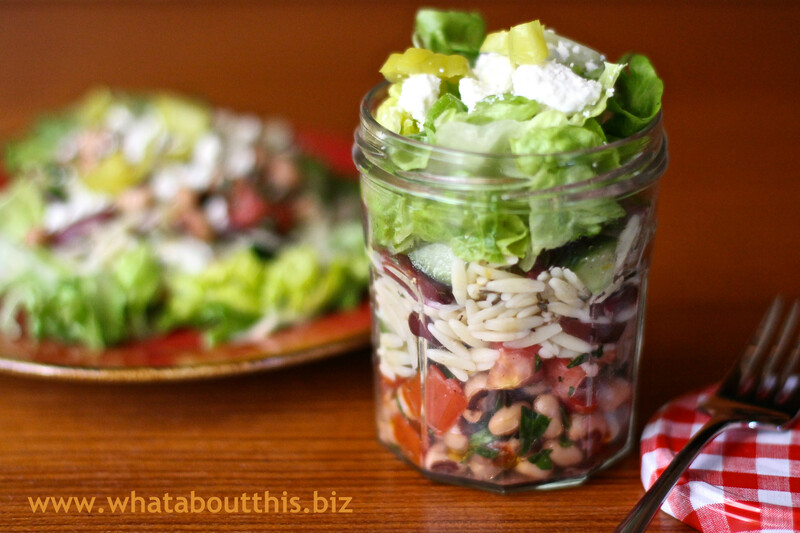 Because it can be made ahead of time, it is a great salad for entertaining. Sweet vine-ripened tomatoes, the gems of summer, make the perfect base for salads. From Kenya comes this recipe that pairs tomatoes with red onions, cilantro, chile, and lime juice. Visually attractive and packed with flavor, this salad is the perfect side dish for summer entertaining. Tonight, those incredible flavors will marry beautifully with the fish tacos I’m serving! 1. 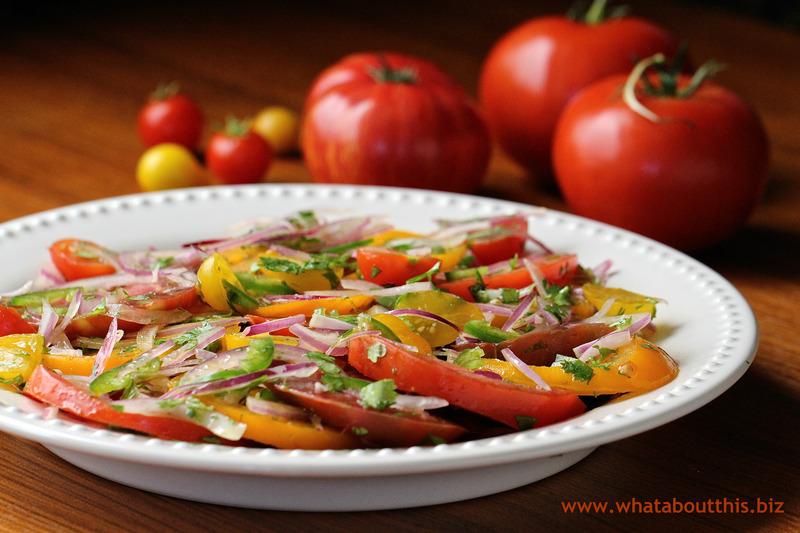 Place the tomatoes into a medium salad bowl with the onions. Stir in the chopped cilantro. 2. Drizzle with the olive oil and stir in the chile, if using. Season and gradually add the lemon or lime juice to taste. 1. One pound of tomatoes is approximately 2.5 large tomatoes. For this recipe I used about two pounds of assorted tomatoes (cherry, heirloom, and beefsteak). 2. I cut the cherry tomatoes in half from top to bottom, but the larger tomatoes, I sliced crosswise into rounds. 3. Because I sliced them into rounds, I gently mixed the salad in a large pan instead of a bowl. This salad is attractive when arranged on a platter. 4. I used half of a red onion instead of a whole one and I’m glad I did. Even with this reduced amount, there were a lot of onions in this salad. 5. Here are some tips from Craig Kielburger, the contributor of this recipe to the cookbook: If you prefer a milder onion flavor, rinse the onion slices in hot salty water before putting them in the salad. This will ensure the onion is less harsh on the palate. Squeeze the lemon or lime juice into the salad just before serving to avoid sogginess. If the tomato and onion are chopped more finely, this recipe also works well as a homemade salsa. 6. The chile is optional, but its heat adds a nice flavor dimension to the salad. Hot summer days evolve into lovely summer evenings. The sun mellows in the sky and temperatures drop to a comfortable warm. It’s the perfect time of day to dine al fresco and to entertain company. Keep the evening enjoyable and effortless, by preparing a simple menu that can be made ahead. 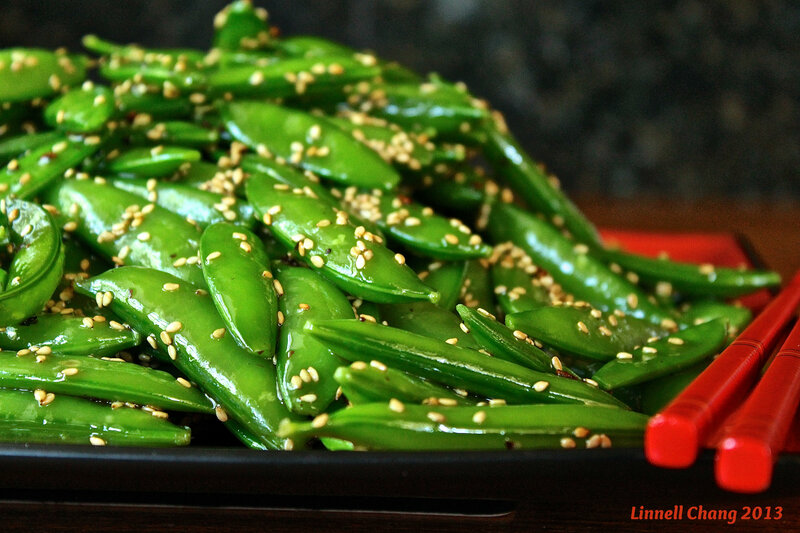 Sugar Snap Peas with Sesame Seed Dressing is just such a recipe. It’s easy to prepare and it can be made earlier in the day. Plus, it’s delicious, visually appealing, and a great accompaniment to grilled meats. 1. Blanch the peas in a large quantity of boiling water just until they turn bright green, about 1 minute. Drain and plunge the peas into very cold water to stop the cooking process. Drain again. Transfer the peas to a mixing bowl. 2. Place the sesame seeds in a large skillet over medium heat. Tossing lightly, toast until golden brown, and add to the sugar snap peas. 3. In the same skillet, heat the sesame oil until smoking hot. Remove from heat and add the red pepper flakes. Let stand for 5 minutes. 4. Pour the oil over the peas, add the salt, and toss to blend. 5. Transfer the peas to a deep bowl or platter and serve hot. 1. I purchase jars of pre-toasted sesame seeds at Asian markets and store them in my freezer. No need to defrost them. Just add them directly from the jar to whatever you are making. If you are toasting your own, keep an eye on them while they are in the skillet. Because they contain oil and because they are small, they can burn quickly. 2. Sesame seed oil is a thick and heavy oil. A little bit goes a long way. That being said, I felt the recipe called for too much of it. The next time I make this recipe, I will start with half the amount. 3. Stir the red pepper flakes into the hot oil and keep stirring. Some of my pepper flakes burned as they sat in the hot oil. Stirring them might have helped prevent burning. 4. Although the recipe says to serve this hot, it also says that it can be served cold. In my opinion, room temperature is best. 5. The recipe can be prepared without the red pepper flakes if you prefer, but I think the little added “kick” really makes the dish. Wedding bells will chime this week for my son and his fiancé. As I happily wade through lists and list of wedding details, I offer you a repost of one of my favorite summer salads. Enjoy! How fortunate it is that tomatoes and basil both thrive in summer heat. When it’s too hot to cook, salads make frequent appearances on the dinner menu in my house and with the bounty of tomatoes and basil outside in the garden, who could resist not finding as many ways as possible to use these two summer favorites? It only gets better – here’s a recipe that combines tomatoes and basil with the healthy goodness of quinoa. In an earlier post Quinoa and Shrimp Salad, I explained why quinoa is a nutritional gem; these tiny seeds contain a balanced set of essential amino acids, making them complete proteins, and are a great gluten-free source of dietary fiber, phosphorus, magnesium, manganese, and iron. 1. Measure quinoa into a sieve and rinse with cold water. Drain. Bring 2 cups of water to a boil and add quinoa. Cover and simmer over low heat for 15 minutes or until water is absorbed. Set aside and let cool. 2. Whisk together all dressing ingredients, except for the olive oil. Pour oil in a small stream into the the bowl of dressing ingredients, whisking the whole time to form an emulsion. Set aside. 3. Toast the pine nuts in a pan until lightly browned and fragrant. While toasting, keep an eye on them and stir them occasionally so that they don’t burn. Let cool. 4. To the cooked and cooled quinoa, add diced onion, diced tomatoes, diced sun-dried tomatoes, and diced basil. Toss gently. 5. Whisk salad dressing again and pour over salad ingredients. Toss again. 6. Serve on a bed of lettuce and garnish with toasted pine nuts. 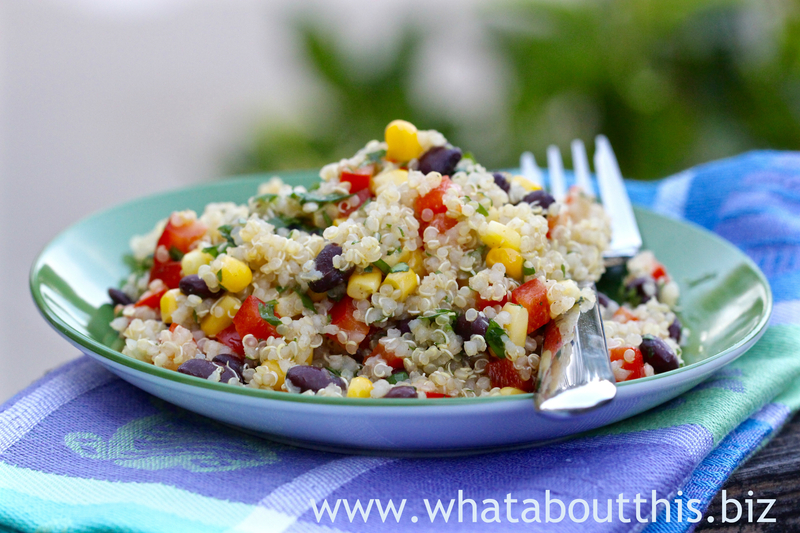 Quinoa is a super food all year round, but it shines especially in summer salads. 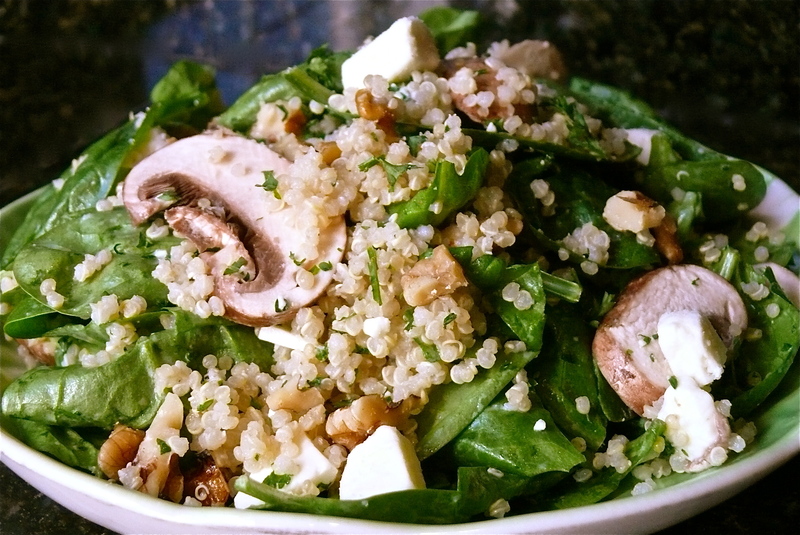 Take an average spinach and mushroom salad and make it more nutritious and more substantial by adding quinoa to it. And by adding omega-3-rich walnuts, this salad goes from healthy to heart healthy! 1. Place quinoa in a strainer and rinse several times with cold water. Place in a medium saucepan with 1¼ cups water and salt to taste. Bring to a boil, cover and simmer 15 minutes, until the grains display a threadlike spiral and the water is absorbed. Remove from the heat, remove the lid and place a dishtowel over the pan, then return the lid to the pan and let sit for 10 minutes or longer undisturbed. Transfer to a salad bowl and fluff with forks. Allow to cool. 2. Add the spinach, mushrooms, walnuts, parsley and optional cheese to the bowl. 3. Whisk together the dressing ingredients and toss with the salad just before serving. Advance Preparation: You can assemble the salad up to a day ahead, but don’t toss with the dressing until shortly before serving. 1. I could not find sherry vinegar in the grocery store, so I used champagne vinegar that I already had at home. 2. I used 1 tablespoon of extra virgin olive oil and 1 tablespoon of Meyer lemon olive oil in the salad dressing. 3. For added flavor, I simmered the quinoa in chicken broth instead of water. Because the broth contains salt, I added no additional salt to the cooking water. 4. Strict vegetarians can choose to omit the feta cheese.